I have looked everywhere and there is very limited live feed for shows. The first one I have found is for Barbara Bui tomorrow 7:00 am Pacific StandardTime. Here is the link for anyone that has time that early in the morning, http://parisfashionweeklive.com/Paris-Fashion-Week/barbara-bui-live-stream-paris-fashion-week-spring-2015. The most entertaining, fun Milan show for me this time around was Moschino. From his current fall fast food and snacks inspired collection to this new Barbie collection, it really makes you smile. They even used the Barbie Girl song for the show. Makes me wonder if he is reliving his childhood. At least he's having fun. 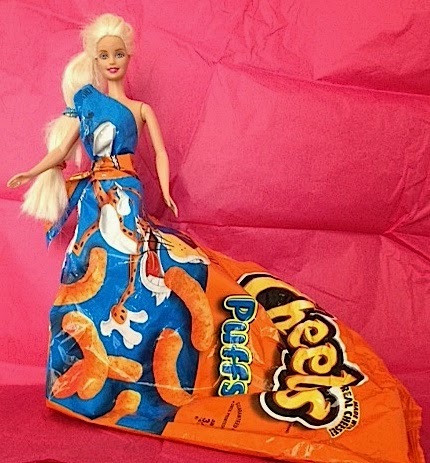 To pay homage to his collections, my daughter's old Barbie, dressed in the finest Cheetos bag with train. Ce la vie, at least my cheap fashion fix can continue! New York Fashion Week Wrap up. Milan Starts today! Well it is comforting to know that I am not the only person in the world that seems to run late. Every fashion show started late or maybe that is just the time they post so they make sure that everyone arrives by the time they really wanted them there. A question I have been asking myself is why does every model's facial expression alway seem to run between "I am bored" to "I dare you to wear this!" The only shows I can remember the models having fun was Desigual and Betsey Johnson. Shouldn't it BE FUN? After all fashion takes us out of our everyday lives. Even the buyers, fashion critics and editors get to escape their everyday schedule to experience fashion week an event so many people look forward too. London was a quick 5 days and you can watch Milan here: http://milanfashionweeklive.com/LIVE at least some of the models actually smile! The good news so far is that black, white and cream are always going to be in style. I found the greatest cheap fashion fix and this one is free (well, as long as you have a phone or computer with internet access). New York Fashion Week is streamed live on: newyorkfashionweeklive.com/LIVE or you can watch most of your favorite designer's runway shows rebroadcast on the same site. From what I have seen so far, some of the trends in three words: pale, lace and laser cut. 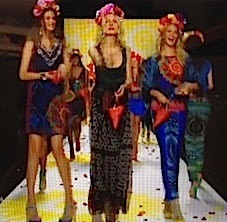 The one show I watched that made me feel like I was on vacation was Desigual. The clothing was a riot of color and bold florals. The models wore smiles and floral headbands that girls going to Coachella would kill for. I can't wait to see which pieces show up in the stores! Just in Time for Fall Fashion! Summer is officially over, Labor Day is here, and so I decided today would be the day I start my new fashion blog. It is an expansion of My Cheap Fashion Fix from my original blog: I Didn't Lose a Husband, I gained Closet Space! With this blog I hope to share (or at least try to) the idea that fashion doesn't have to be expensive to be great. Fashion should be fun, and used to express who we are at any given moment. There are a lot of great deals out there, and vintage is fabulous since fashion is never really new it is recycled over and over again. So I hope you join me on my new blogging trail!